On July 1st, 33,000 Rotary Clubs around the world each get a new president. On the 6th August, (but effective 1st July) the Breede River Winelands Rotary Club inducted new President, David Hall who took over from Ronel Preston. 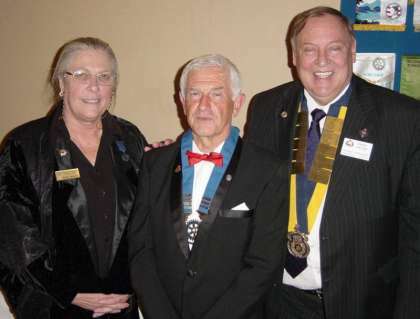 The club was privileged to have as its distinguished guest, the Governor of the Rotary District 9350, Deon van Zyl. Deon is a distinguished judge and is now Judge Inspector of Prisons. Rotary began in Chicago in 1905, but the BRW club is just six years old this year, with around 20 members, scattered around the five towns of the valley. In spite of the youth and relatively small size of the local club, the total value of the projects (most of them ongoing) is already almost 1 million rand. Rotary has a scheme called �Matching Grants� which enables a small club like our local one to link up with partner clubs overseas and this can sometimes increase its own donation by as much as ten times. Hospice and McGregor Schools have already received large grants from this scheme and this year our Rotary club is building more links with partners in Germany, the Seychelles and Hong Kong to raise over 150,000 rand that will help improve the facilities at an informal settlement in Bonnievale. "Fundraising projects often involve hard work but are always fun! ", says David. " We have recently run a "Murder Mystery Weekend" and a Bridge Tournament and our next big event will be Carols@Christmas, shared with the Friends of the Hospital, on Sunday December 11th. We also provide assistance for the Argus Pick �n Pay cycle race in Cape Town, run golf days and much else besides". Our local club was one of a small number chosen by Rotary International Headquarters to test a new approach to membership. Many people would like to join a Rotary Club but are put off by the subscription or the time commitment; so the club is introducing a new category of associate membership and invite anyone who shares Rotary's aim of Service to the community, to get in touch. Attend one of the club meetings � you will find that the BRW Club is friendly and you will soon feel at home! Ring 072 045 0891 or 083 250 3192 for more information.